Group trips require careful planning ahead of time, especially when it comes to transport. Have you decided how your group’s members will arrive at your destination safely and on time? Carpooling and rideshare apps like Uber divide group members among multiple cars. This makes keeping track of everyone and spending quality time together nearly impossible. For peace of mind, hire a coach for your next group outing. You’ll have plenty of room for everyone to ride comfortably, and you can stow all of your luggage securely beneath the bus. 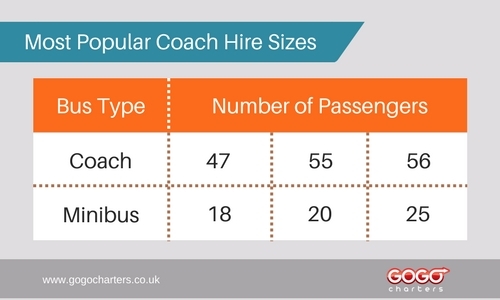 Check out our Complete Guide to Coach Hires below to learn the ins and outs of booking a bus! A coach, also called a motorcoach, is a vehicle that is privately rented by a group, organisation, or business. Instead of travelling along a set route like public buses, coach hires travel according to the group’s personal itinerary. Motorcoaches have large tinted windows around the top half of the vehicle, allowing natural lighting to shine through. Passengers can gaze at the sights around them as they travel to their destination. On the body of the vehicle, bus companies often wrap the sides with their logo. Inside, you’ll see the driver’s seat at the front on the bus and rows of plush seating for passengers throughout the coach. Most models have overhead compartments above the seats for storing personal items. Schools and universities. Students, teachers, and chaperones travel by bus for field trips to museums, historical centres, and art exhibits. College students and faculty members also book coaches for campus tours, seminars, extracurricular clubs, and sports tournaments. Couples and wedding planners. Brides and grooms favour buses for shuttling guests and the wedding party to and from venues. Friends of the lucky couple hire coaches for engagement parties, hen dos, and stag dos. Business professionals. Corporate travel planners prefer coaches to public transportation when attending company events. With on-board WiFi, they can check emails, revise presentations, and connect with clients on the go. Churches. Congregation members use buses for service projects, domestic mission trips, fellowship activities, and conferences. Sports teams. Athletes and coaches choose to travel by coach for out of town tournaments to keep their team together, on time, and motivated for the big match. Entertainment companies. Event organisers rent minibuses as shuttles to transport music festival attendees to and from the venue. How many seats does a coach hire have? No matter the size of your group, there is a motorcoach to accommodate you. A standard bus holds around 56 passengers, but seating options often range from 36 to 60 seats. If you’re looking for a smaller vehicle, a minibus holds 35 passengers or less. They make excellent shuttles for weddings, festivals, corporate events, and more. When you call our friendly staff at 44 20 3617 1779, they’ll offer you a free, personalised price quotation on the perfect bus for your group. What’s the difference between coaches, minibuses, party buses, and entertainer coaches? Standard coach hires, minibuses, party buses, and entertainer coaches are all rented by a group for private use and are operated by a professional driver. The differences between them lie in their sizes and uses. Most groups reserve a standard coach hire or a minibus. A coach holds 36 passengers or more while minibuses carry 65 or fewer. Because standard coaches have more space, they come with more amenities like a toilet and extra luggage compartments. Small groups who are travelling for celebrations like hen and stag dos or birthday parties favour party buses. Their seats are arranged around the sides of the bus so passengers can chat with friends, dance, and play games. For touring musicians and celebrities, entertainer coaches hold 8 to 12 passengers on average and provide luxury amenities. Many include a master suit, sleeping bunks, a lounge area, kitchen facilities, a toilet, storage compartments, televisions, and WiFi. What amenities are included in a coach hire? 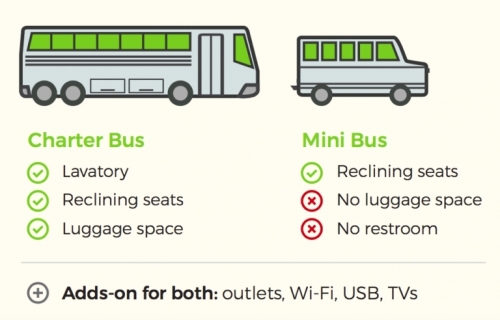 Most modern buses also include the option to add wireless internet and power outlets to your rental. To ensure your bus has the exact amenities you need, let your reservation specialists know your group’s requirements when you call us at 44 20 3617 1779 for a quote. Can we bring food and drinks on a coach hire? You can bring outside food and drinks on most coach hires, but it’s a good idea to verify with your bus company before your trip. Even if they do allow food and drinks on their buses, it’s best to leave smelly and messy foods at home for the sake of your fellow travellers. If your group leaves behind spills or crumbs, be sure to clean them up at the end of your rental. Your bus service provider may charge a cleaning fee if messes are left for their staff to clean. Most buses have bins at the front to collect your group’s rubbish before exiting the coach. Can we drink alcoholic beverages on the coach? 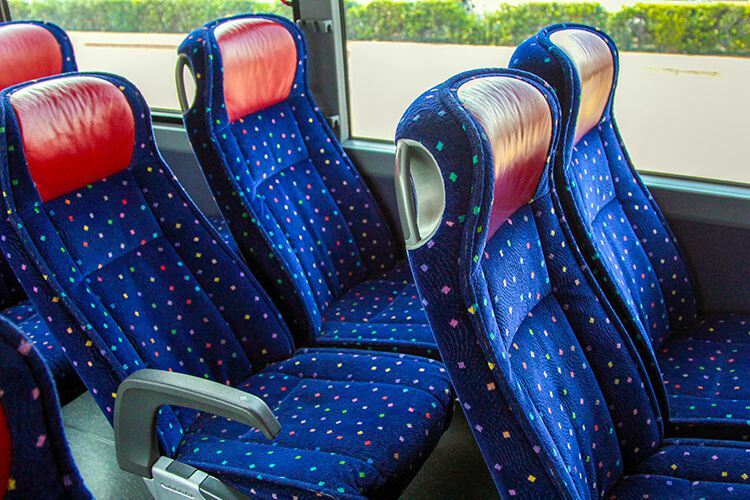 Adult passengers are permitted to bring alcoholic beverages on most coach hires, but your group may need to pay a security deposit to cover any damages that occur. Let your reservation specialist know that you are planning to bring drinks on the bus at the time of booking so they can make necessary accommodations. To ensure everyone’s safety, remind your group members who are planning to drink that reckless behaviour can distract the driver and create a hazardous situation. Are pets allowed on motorcoaches? Unfortunately, most bus companies have a strict no-pets policy. However, bus companies are required to allow disabled passengers to ride with assistance dogs according to the Equality Act of 2010. What items are prohibited on a coach? While each bus hire company may have differing policies, it’s best to leave weapons, explosives, flammable materials, and dangerous chemicals at home. It is also prohibited to smoke on most buses, but you may smoke at rest stops in designated smoking areas along the way. If you are unsure about bringing a specific item, ask your bus company at the time of booking. Do coach hires have beds? Though standard coaches don’t include beds, they do have cushioned, reclining seats for your comfort. If you need to catch up on sleep during the ride, bringing a neck pillow will help you rest comfortably. If beds are a requirement for your group, consider booking an entertainer coach which holds between 8 to 12 bunks and a master suite in the back. These large vehicles also include a lounge area, kitchen facilities, a toilet and washroom, satellite TVs, and WiFi. Do coaches have storage space? Unlike cars and public transportation, coaches have a significant amount of storage for large groups. Passengers can place their personal belongings in the overhead compartments above their seats to keep the aisle free. Beneath the bus, there is room for each passenger to stow a suitcase. Because of their size, minibuses have less storage space and are better equipped for small groups. No matter what type of group you’re booking for, our reservation specialists will find the best bus for your group’s needs when you call us at 44 20 3617 1779. What are the toilets on a coach hire like? A toilet on a standard motorcoach is compact and often includes a commode and a handwashing station. Because of limited space and the movement of the bus, we recommend that passengers only use the on-board lavatory only if it is absolutely necessary. Do coach hires have seat belts? Modern buses made after October 2001 are required to have seat belts. The driver is responsible for ensuring all children under 13 are properly secured in a seat belt or child restraint. Passengers over the age of 14 are responsible for belting themselves up. At this time, the law only requires passengers above the age of 14 to wear seat belts, but it is highly recommended that all passengers wear seat belts when possible. For more information, read ROSPA’s seat belts guide. Are coach hires wheelchair accessible? According to the 2002 Public Service Vehicles Regulations, all coaches must accommodate wheelchair users by 2020. Most commercial vehicles already accommodate disabled passengers, making it easier for groups of all kinds to travel comfortably. If one or more of your group’s members requires accommodations, let our reservation specialists know when you book your trip at 44 20 3617 1779. When you hire a coach, you’ll receive a safe, professional driver to navigate your bus. Your driver will be in charge of your group’s safety, so partner with a company whose drivers maintain an excellent reputation. Keep in mind that EU regulations state that drivers can only operate their vehicle for 9 hours in a day and must take a break every 4.5 hours. If your trip’s schedule requires driving for more than 9 hours in a day, you’ll be assigned a second driver to accompany your group. For trips taking place overnight, you’re responsible for booking your driver’s hotel room. While their hotel room doesn’t have to be elaborate, it does need to be safe and comfortable since your group’s safety is in your driver’s hands. At the time of booking, your reservation specialist will ask you to submit your trip’s itinerary. This includes every pickup and drop off location. If you decide upon last-minute stops you’d like to make after your trip has begun, you may ask your driver. However, if they decide to accommodate your request, you may be subject to paying additional fees. How far in advance should I hire a coach? For the best coach at the best possible rate, hire your coach at least 1 to 3 months in advance. For trips taking place in busy months like April, May, and June, consider booking at least 6 to 9 months in advance if possible. We understand that last-minute trips come up all time, and in cities we directly service, we can pair you with a coach in two hours or less. Call us now at 44 20 3617 1779 for a free quote on your upcoming trip! How much does a coach hire cost? Rates for your bus rental will depend on several key factors including your trip’s mileage and duration. Most companies charge by the mile for long distance trips and by the day for trips that span multiple days and require the driver to wait for long periods of time. For a fast, personalised quote, call us 24/7 at 44 20 3617 1779. Our knowledgeable staff will help you book the perfect fleet of buses for your upcoming trip! While tipping isn’t required, it’s an excellent way to show your gratitude for a job well done. We generally recommend tipping 10 to 20% of the cost of the rental. Gratuity is rarely included in the final bill, so you can ask your reservation specialist about tipping options before your trip. Before contacting prospective bus companies for a quotation, make a note of the essential details of your trip. Keep this information on hand so your reservation specialist can quickly pair you with a bus that meets your needs. What are the names and addresses of your trip’s destinations? At what times will you need to be picked up and dropped off? How long will your trip last, and on what day will it begin? Will you be picking up additional passengers during your trip? If so, how many? Do you need a wheelchair-accessible coach? Which amenities does your group require? Which bus company should I hire? The most important factors in choosing a bus company are location, reputation, and availability. Look for a service provider that is located near your pickup location to save money. Choosing a company in a city far from your starting location may result in additional charges to pay for the coach to drive to your location. With direct service in over 50 UK cities, we can ensure that you won’t overpay for extra travel costs for your coach. To determine a company’s reputation, search for online reviews and testimonials. See if past customers trust the company and if they would use their services in the future. Before you sign the dotted line, read contracts and service agreements carefully so you know what to expect, and don’t be afraid to ask questions. We can help you quickly find a modern, up-to-date motorcoach for your upcoming trip. Since launching our company in 2013, we’ve paired over 1 million satisfied customers with coaches for a variety of occasions including weddings, corporate events, sports tournaments, school events, and church events. Our team is available any time of the day at 44 20 3617 1779 to provide you with a free, no-obligation quotation. This guide is designed to help you make an informed decision on coach hires without missing important details. Now that you know what to expect, you can book your first bus rental with confidence.